Bobsled T-Mobile : Bobsled Voip Facebook Calls | Free Pc to Phone Calls, Free Voip Calls to India International ! T-Mobile has launched a voip service called Bobsled which is offering free high quality calls to your Facebook friends and any number in the U.S., Canada or Puerto Rico. What you require is just internet connection and you can call from anywhere in the world. Bobsled by T Mobile is offering free calls directly from browser and you don't even require a phone to make call. This is simple Pc to Phone Calls! Though Bobsled also have iPhone & Android app as well to call free. Bobsled is specially good for calling facebook friends. Lets check about Bobsled on Facebook! In order to call your facebook friends using bobsled, you need to use register with bobsled. After signing in to your account, choose the phone icon next to your friends name. You also need to pair your facebook friends phone number in your bobsled account. Bobsled is an application available for your Browser/PC/Smartphone using which you can call any phone in US/Canada for free. Additionally it can sync with your facebook friends contacts (all over the world) and those who are also using bobsled can also be called for free. Please note that if you want to call a friend in any other country apart from US/Canada then he needs to have bobsled installed on his phone. Bobsled Facebook app enables friend-to-friend voice chat. Once you install the app a little phone will appear by online friends’ screen names (those who have the app installed, anyhow), and after that it’s just one click away, with confirmation on the other side of course. They have plans to include video chat as well. So you can now use any of these apps and call any mobile in US or Canada or your facebook friends for free. 1. It is flexible : call from anywhere in world. 2. Call from browser or app. 3. Bobsled Social : Call Facebook Friends. Some additional Bobsled Smartphone app features. Simply tap on a friend to call them. Bobsled will find them on Facebook, their Android, or their iPhone/iPad/iPod Touch, and connect the call. If they are not there, leave a Bobsled voice message for them on Facebook. This will leave a public message on your friend's wall. It also offers some interesting features, that is recorded messages send on facebook. Just record and send your boyfriend a Happy Birthday message. 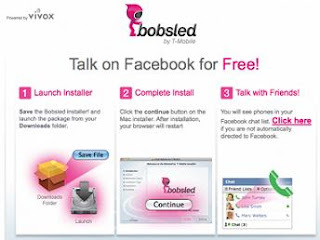 Bobsled lets you record a Voice Message and post it to your friend’s Facebook wall. For more info, visit Bobsled.